PROFESSIONAL COFFEE TOOLS DESIGN SOFTWARE for the BARISTA, SPECIALTY ROASTER, CAFÉ and RESTAURANT OPERATOR and COFFEE & ESPRESSO BEVERAGE EQUIPMENT DESIGNER Based on MoJoToGo – Best New Product SCAA EXPO 2010 VST's UNIVERSAL BREWING CONTROL CHART SOFTWARE For Coffee, Espresso, Cupping and Equipment Design • Simple 2-Step Design Process with Direct Chart Data Entry Select the point on the Chart and the amount of Beverage, Brew Water or Coffee Dose. VST CoffeeTools™ does everything else. • Drag-and-Drop coffee recipe design works in all modes. All recipe values are automatically calculated and displayed for any brewing recipe protocol. Full conversions provided, including between brewing methods. 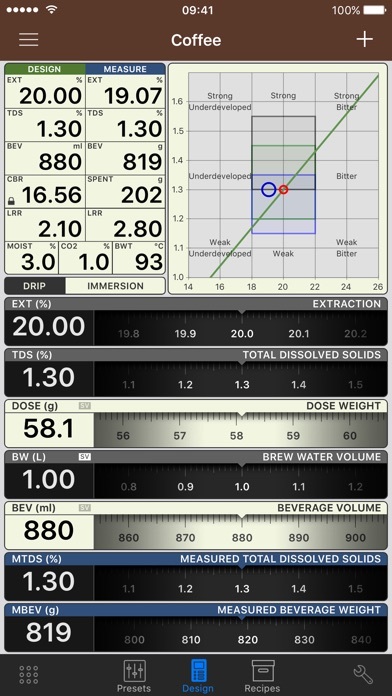 • Portrait and Landscape mode charts supported • Works with all types of brewing methods including: drip and auto-drip; infusion and full-immersion, cupping and espresso methods. • Supports iTunes File Sharing. Import/Export all data and measurements. 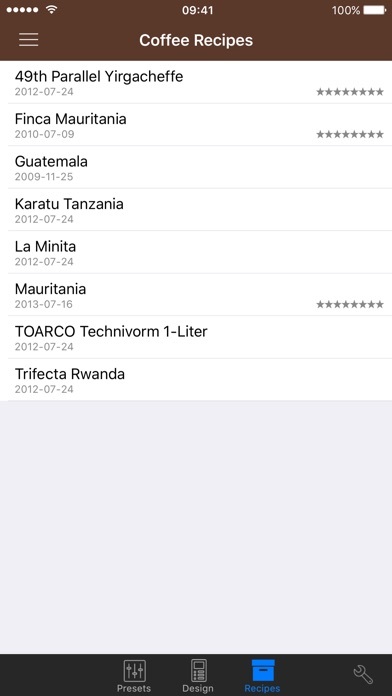 • Share individual recipes, data & measurements to/from other versions of VST CoffeeTools. • Fully functional with or without a coffee refractometer. 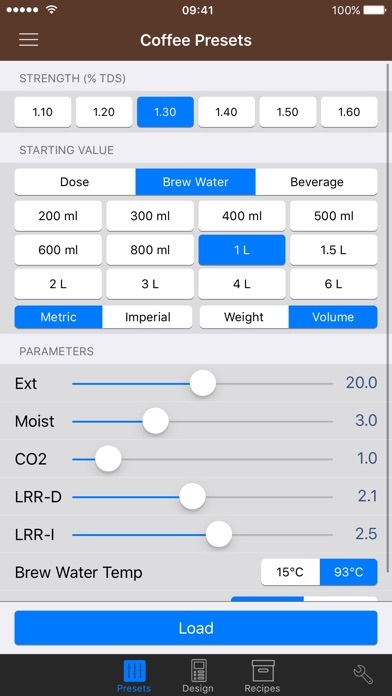 Refractometer measurements may be plotted separately using measured total dissolved solids (% TDS) and Beverage amounts to chart and compare actual brew results to design target values. • Conversions for volume and weight measurements and U.S. Standard (English) to Metric units are supported in any combination. Design recipes for Drip can be directly converted to/from Infusion/Immersion methods, while maintaining identical extraction and strength relationships. •Extraction Yield normalization is automatically provided on the VST Universal Brewing Control Chart for all brew methods: Drip, Infusion, Espresso, Cupping; brew water temperature (volume measurements); liquid retained in spent grounds; CO2 & Moisture content of the ground coffee. Defaults are provided for all preferences, and may be customized separately for all modes as required. • A wide array of Presets are provided in all modes of operation that are typical of those found in home and commercial service. Each mode provides a full set of custom Presets that are user defined. • Full recipe details database maintained separately for Coffee, Espresso and Cupping. Sorting by Date, Name and Taste Score provided. 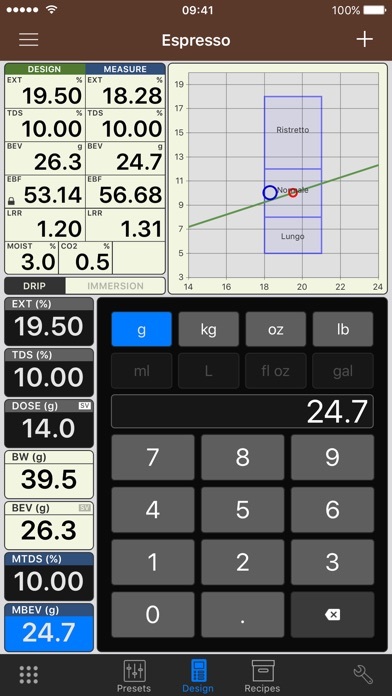 • The VST Universal Brewing Control Chart supports direct touch-screen data input, pan and zoom functions, auto-scrolling of chart with ordinate and abscissa axis and reset functions. Design points for % TDS and % EXT are step-less with snap-to-grid increments provided (TDS @ 0.05% and EXT at 0.1% increments). 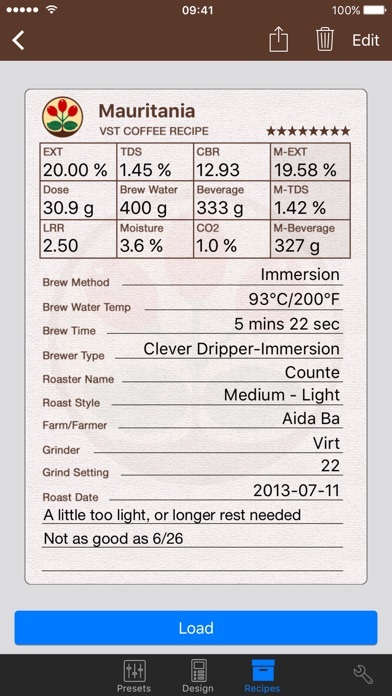 Region of Interest (ROI) overlays are optionally provided for SCAA, SCAE, NCA regions with taste defect labels. Custom User defined ROI is also included separately for all modes. • Complete calculation results are displayed for: Dose, Brew Water, Beverage, Liquid Retained Ratio, Spent Grounds Weight, Coffee or Espresso Brew Ratio, Extraction Yield in both Design and Measured values.